This week, OP Dacia would like to invite you to reflect on Sunday’s gospel reading yourselves. Read the gospel text slowly, several times, and – if possible – aloud. What words catch your attention? What do you feel they are saying to you here and now, in your particular situation, in our time? What would you have focused on if you were to preach on the text? In this week’s article you will first find the gospel text (Mark 1, 1-8) in English, and then some pointers from Fr. Michel de Verteuil of Trinidad. We recommend that you first reflect on the text yourselves before reading Fr. Michel’s input. Like last week’s, this reading should be read in sections. Omit verse 1 which is an introduction to the entire gospel of St Mark rather than to this part of it. In verses 2 and 3 you can focus on the fact that the story of John the Baptist was already written in the book of Isaiah, or you can look at the content of the verses. The first two lines are from Malachi, and the pronouns must be interpreted correctly: they are saying that when God is about to come into the life of a person or a community he always sends a messenger to prepare the way for him. 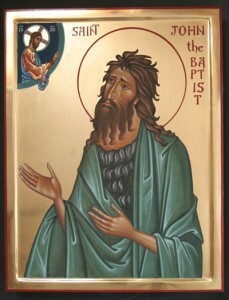 In the next part of the prophecy be sure to interpret correctly the meaning of ‘cries in the wilderness’, which means that God’s prophets alway announce confidently to those who are in the wilderness that they must not despair, but rather act as if God’s grace will come to them at any moment. Verses 4 and 5 summarise the mission of John the Baptist who touches a community or nation so that the people commit themselves to a renewed life, recognising their former sins. Verse 6 speaks of the Baptist’s simple lifestyle, in sharp contrast to the extraordinary success of his preaching in the previous verses. – at a time when he was feeling frustrated and knew he must be content to wait for God’s moment of grace. You can read more about lectio divina on the Dominican Biblical Institute’s webiste.